Zippered main compartment with a U-shaped opening and reinforced double 19-1/2" handles. Large zippered front pocket with additional exterior zippered pocket. Two front-adjustable elastic cord pockets. A lot of the runners were happily surprised with the giveaway. two color printing and quality. Quality of the cap was good. The logo was marked as color and was printed. 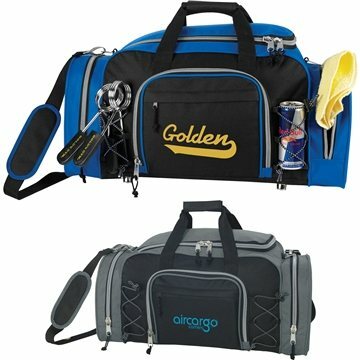 These Bags are durable along with a great cost. Great Experience! Easy online setup and ordering. We love these! They are nice and everything we expected. Everybody LOVES them! And the price just can't be beat!